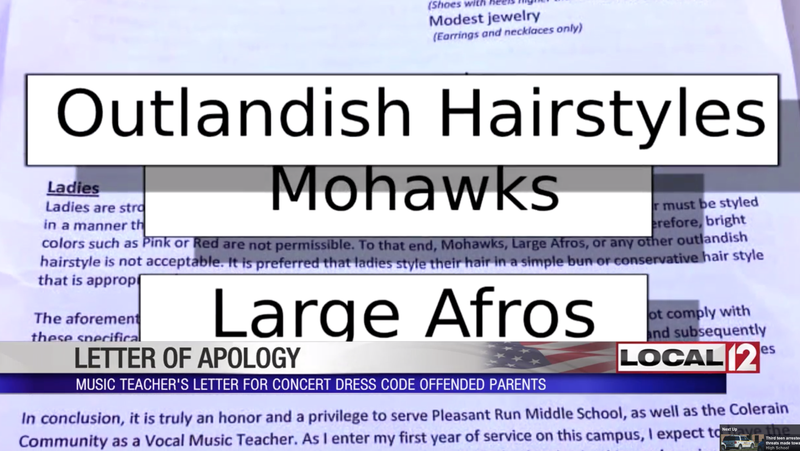 District officials at an Ohio middle school have clarified their dress policy after a teacher’s letter banning Afros, barber’s designs and other “outlandish” hairstyles from an upcoming student performance sparked outrage. Parents at Pleasant Run Middle School outside of Cincinnati received a memo from vocal music teacher Steven Reeves, who is black. The letter outlined the attire for the school’s 2018 winter concert and included a lengthy section for acceptable hairstyles, the Cincinnati Enquirer reports. Aside from a Trumpian style of grammar that used random capitalizations and quotation marks (which can be excused; after all, he’s only a teacher), Reeves threatened to send students home who did not comply, forcing them to forfeit their grade for the concert. After the letter went viral on social media, the Northwest Local School District apologized by posting a statement on its Facebook page. The revised guidelines for the upcoming concert require students to wear a white top and black pants or skirt. Students are encouraged to look their best the evening of the concert. The choir is now asked to report to Northwest High School at 5:30pm on December 13, 2018. I hope to see all of you at the concert. Your students are working so very hard. I believe you will really enjoy their performance. While Reeves did not say how hairstyles influenced one’s musical performance, he also declined to comment on whether he thought “Dred-Locks” were invented by former slave and historical legal figure Dred Scott.